Aunsoft Final Mate is a great TOD File Joiner which not only helps you to perfectly convert or edit TOD files, but also gives you the easiest way to combine, merge, join 2 or 3 or multiple TOD files into only one without recoding or losing quality. So if you have lots of TOD files, and want to joined TOD files, or also keep 5.1 channels, please try this all-in-one TOD File Joiner right now. First, free download this best JVC TOD File Merger here, install and run it. 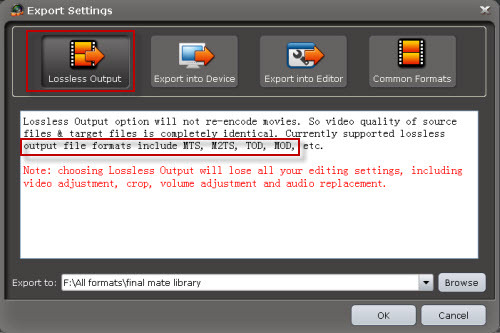 Step 1: Capture raw TOD files you want to merge from TOD camcorder to Aunsoft Final Mate. From the timeline, you may notice the vernier, which is used as time pointer. Click on the Vernier, and move to the time point you want to cut, and click the Split button to cut the video. Then select the unwanted or unimportant parts and click Delete. 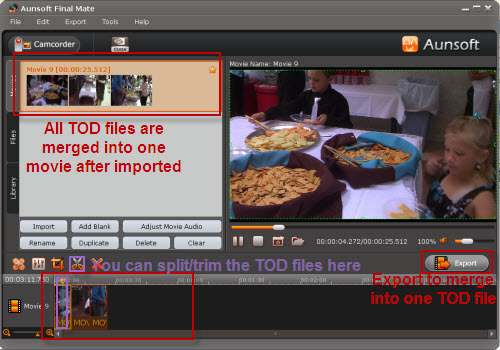 Step 3: Merge/Join/Combine multiple TOD video files to only one file and select output lossless. Click the Export button and then choose Lossless Output and click the OK button, the TOD files Joiner will start merging large TOD files into one .tod file without conversion at the fast speed. The non-conversion process will prevent loss of quality when merging multiple TOD files. Wish this article help you to merge multiple JVC TOD files without losing quality into one with ease on your PC. With this program, you can also convert TOD files to MP4, AVI, MOV, WMV, FLV, MPG, VOB, etc with smaller size for playing, editing, burning, sharing.